1B Umpire Hunter Wendelstedt ejected Braves LF Jeff Francoeur for arguing a Replay Review (out) decision that affirmed Wendelstedt's out call in the bottom of the 9th inning of the Indians-Braves game. With one out and none on, Braves batter Ender Inciarte hit a 0-1 knuckle curve from Indians pitcher Cody Allen on the ground to first baseman Carlos Santana, who threw to Allen as Inciarte arrived at first base, ruled out by Wendelstedt. Upon Replay Review as the result of a challenge by Braves Interim Manager Brian Snitker, Wendelstedt's ruling stood based on a lack of clear and convincing evidence to confirm or overturn Wendelstedt's call, the call was correct. At the time of the ejection, the Indians were leading, 5-3. The Indians ultimately won the contest, 5-3. This is Hunter Wendelstedt (21)'s second ejection of the 2016 MLB regular season. Hunter Wendelstedt now has 9 points in the UEFL Standings (5 Previous + 2 MLB + 2 Correct Call = 9). Crew Chief Hunter Wendelstedt now has 4 points in Crew Division (3 Previous + 1 Correct Call = 4). This is the 87th ejection report of the 2016 regular season. This is the 44th player ejection of 2016. Prior to ejection, Francoeur did not participate in the contest. This is Atlanta's 4th ejection of 2016, T-1st in the NL East (ATL, NYM 4; MIA, WAS 3; PHI 0). 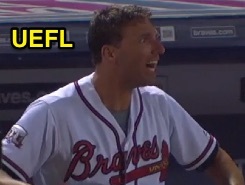 This is Jeff Francoeur's first ejection since June 14, 2012 (Dan Iassogna; QOC = Y [Balls/Strikes]). This is Hunter Wendelstedt's first ejection since May 20, 2016 (Adam Eaton; QOC = Y [Balls/Strikes]). Wrap: Cleveland Indians vs. Atlanta Braves, 6/28/16 | Video available via "Read more"